HDPE 300 is produced by cross laminating two sheets of high density polyethylene, creating additional strength for optimum puncture and tear resistance. 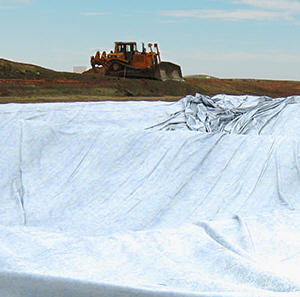 This unique process aligns the molecular structure of the high density polyethylene which intensifies the sheet’s resilience lengthwise. By laminating these two layers of stretched film across the bias, the sheet has equal strength in all directions. NOTE: The OSHA Hazard Communication Standard was recently revised to require that MSDS for hazardous chemical products be updated by June 1, 2015 to meet the updated Globally Harmonized System of Classification and Labeling of Chemicals (GHS) format and content requirements. Our HDPE liners are not classified as hazardous chemicals under the 1910.1200 rule. Our products meet the OSHA definition of manufactured “articles” that will not expose users to hazardous chemicals under normal and expected conditions of use. Therefore, these HDPE liners are exempt from all requirements of the rule, including the requirement to produce an MSDS sheet. Please Use This Form To Contact Us With Your Liner Needs and Questions, and feel free to Contact Us to request individual samples for any of the products listed.